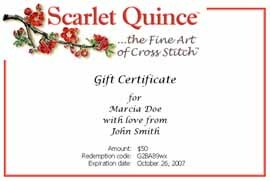 A Scarlet Quince gift certificate is always welcome and it's so easy to give. Click create to create a gift certificate. Just enter your name, the name of the recipient, and the dollar amount. The gift certificate will be customized with the names you specify, for example, "Mary Louise" or "Uncle John", and you can add a personal message such as "love" or "with thanks for your hospitality". You can add as many gift certificates as you like to your shopping cart. See How to Buy for information on your payment options. After you check out, we'll send you an email summarizing the order and giving instructions on paying, which depend on the payment method you choose. We'll ship your gift certificates after we receive your payment. Gift certificates are good for five years from the date of purchase. Each one has unique redemption code which identifies it. To use a gift certificate, just shop as usual. When you're ready to check out, you enter the redemption code. If the price of your order is more than your gift certificate amount, you need to pay the difference using any of our payment methods (click How to Buy for more information). If the price of your order is less than your gift certificate amount, your certificate will continue to be good for the unused amount. Please note also: gift certificates are not redeemable for cash. Gift certificates cannot be replaced if lost or stolen. There is no sales tax on the purchase of a gift certificate, but applicable sales tax is charged on purchases made with gift certificates. Was so glad when I found this site, as this is the type of cross stitching that I love to do. I find the more challenging the picture the more I enjoy working on it. Thank you for these beautiful patterns on your site.